Figure 32.1. 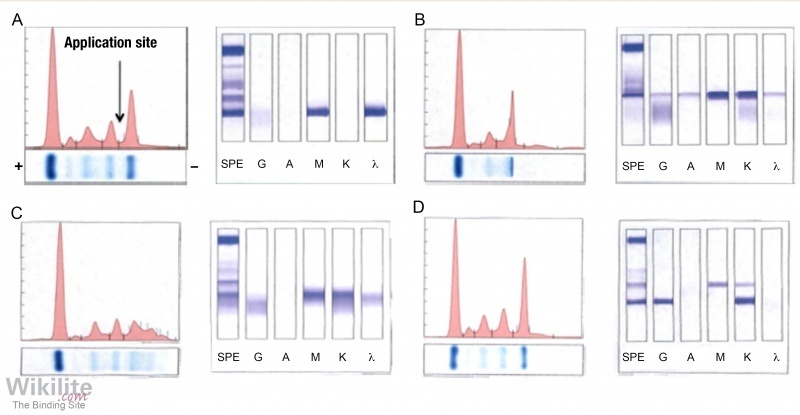 Serum electrophoresis of IgM monoclonal proteins. Each example consists of the electropherogram (left) and the immunofixation gel (right). (A) IgMλ in the γ region with a straight forward quantitation. Position of anode (+) and cathode (−) are shown. (B) “Sticky” IgMκ showing precipitation at the application site and atypical peak shape on electropherogram. (C) IgMκ running as 3 peaks, most likely corresponding to higher order complexes. (D) Biclonal gammopathy (IgMκ and IgGκ). The IgMκ co-migrates with other serum proteins in the β-region. (Reproduced from Clinical Lymphoma, Myeloma & Leukemia , Copyright 2013, with permission from Elsevier). In WM, accurate determination of serum IgM is considered crucial both at diagnosis and to monitor response to therapy . Changes in IgM levels may be determined by serum protein electrophoresis (Section 4.2.1) or nephelometry (Section 4.4.1) . However, there are limitations to these routine laboratory techniques for IgM quantitation. Nephelometric total IgM assays may be unreliable due to an overestimation of IgM polymers, leading to a poor correlation with serum protein electrophoresis (SPE) . Other disadvantages include the inability to distinguish between polyclonal IgM and disease-associated monoclonal IgM, especially at low monoclonal protein concentrations, when total IgM measurements may contain a significant proportion of polyclonal IgM. Nephelometric antisera may also react variably with monoclonal IgM from different patients . Whilst monoclonal IgM quantitation by SPE has the advantage of separating monoclonal IgM from polyclonal background IgM, the method is more labour-intensive than nephelometric quantitation (Chapter 4) . Other limitations of SPE include: inaccurate quantitation when the concentration of monoclonal IgM is low; cases of ‘sticky IgM’ (in which insoluble aggregates form that precipitate in the loading site); the presence of IgM multimers (which create ‘overlapping peaks’); and comigration of monoclonal IgM in the β-region alongside other serum proteins (Figure 32.1). In addition, the presence of cryoglobulins affects IgM measurements by all methods . Kastritis et al. advise that IgM levels may be determined either by densitometry of serum protein electrophoresis or by total serum IgM using an automated system. Immunoglobulin heavy/light chain immunoassays (Hevylite, HLC), may provide some benefits. HLC assays quantify the different light chain types of each immunoglobulin class (i.e. IgMκ and IgMλ), and the molecules are measured in pairs to produce HLC ratios (i.e. IgMκ/IgMλ, Chapter 11) . HLC analysis also allows the concentration of the uninvolved HLC-pair to be measured (e.g. IgMλ in an IgMκ patient). When the concentration of the HLC-pair is below the normal reference interval, this is termed “HLC-pair suppression” (Section 11.2.2). In a WM patient with monoclonal IgMκ (for example), nephelometric measurement of IgMκ may provide a measure closer to the concentration of the monoclonal immunoglobulin than a total IgM assay. In addition, measurement of the HLC ratio, which is influenced by HLC pair suppression, has been found to be a sensitive marker of tumour activity in other diseases. However, if a WM patient's tumour produces measurable quantities of monoclonal sFLCs, monitoring these concentrations could avoid most of the limitations encountered with monoclonal IgM quantitation (above).